I’m posting this in a bit of a rush today. We are having my daughters 6th birthday party today, so in about 3 hours I will have about 15 little girls going crazy at my house. My daughter insisted on a Valentines theme, so I still need to finish up her cake and make the frosting for the sugar cookie decorating station, and clean. So I’m a little stressed right now. It will be fun though!! Lots of amazing goodies to snack on, but lots of work. This recipe was so good though!! Whoever made it is a genius. I’m normal not a huge fan of grilled cheese sandwiches, but this caught my eye, and when I saw all the different stuff that went into this I had to try it. It’s amazing! It’s got this Italian feel flavor from all of the cheeses and garlic, with just a slight spicy kick to it from the red pepper flakes. And lets be honest, I’m a country girl at heart, so anything with bacon is going to win awards in my book. 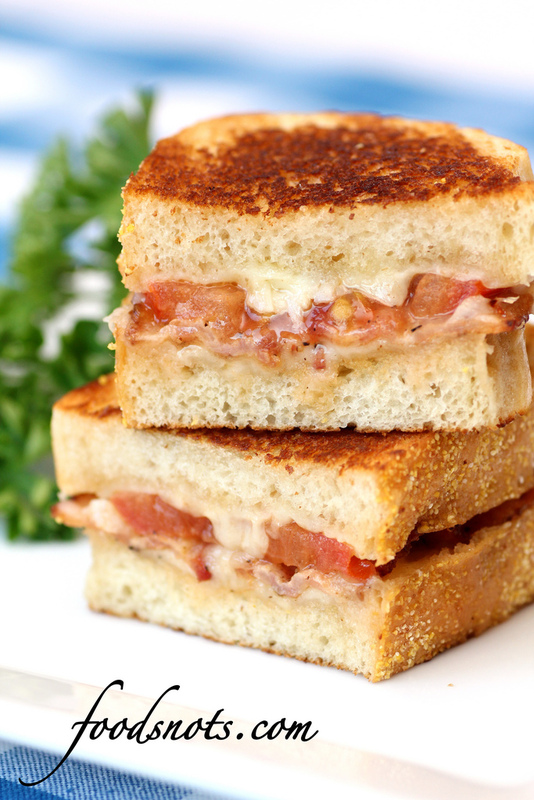 Like a gourmet BLT, but substituted with cheese instead of the lettuce. It’s to die for!! Enjoy! Cook the bacon in a heavy-bottomed skillet until browned and crisp. Remove to a paper towel-lined plate. Pour off the grease from the pan and wipe clean. Combine the cheeses and red pepper flakes in a small bowl. Lay 4 slices of the bread on you work surface, and distribute half of the cheese evenly among the bread. 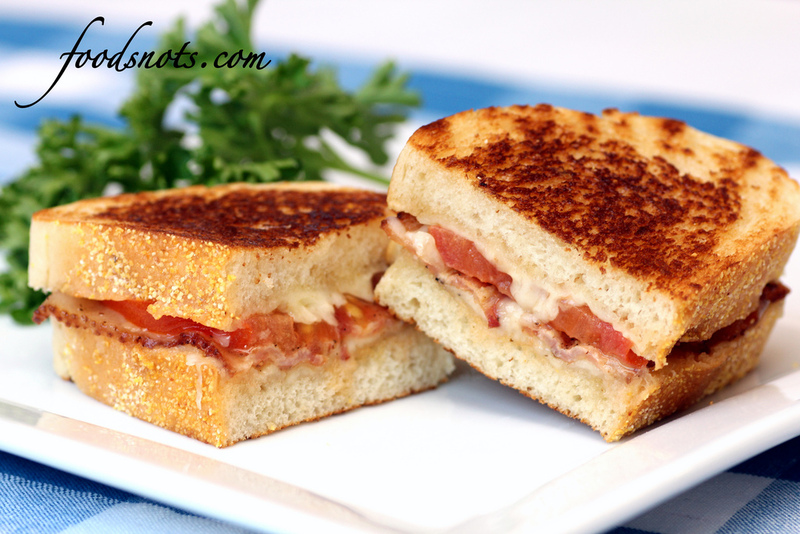 Top the cheese with 2 slices of bacon and then 2 or 3 slices of tomatoes (enough to cover the cheese and bacon). Evenly distribute the remaining cheese among the 4 sandwiches. Lightly butter one side of the remaining four slices of bread, and put them on top of the sandwiches, butter side up. Heat your heavy-bottomed skillet over medium heat. Place the sandwiches butter side down in the pan and cook on the first side until the bread is golden brown and toasted. Meanwhile, butter the top slice of bread on each sandwich. Flip the sandwiches using a spatula and continue to cook on the other side until the bread is golden brown. You can use the spatula to compress the sandwich as it cooks on the second side. Remove the sandwiches from the pan and immediately rub both sides with the cut side of a garlic clove. Cut the sandwiches in half and serve.